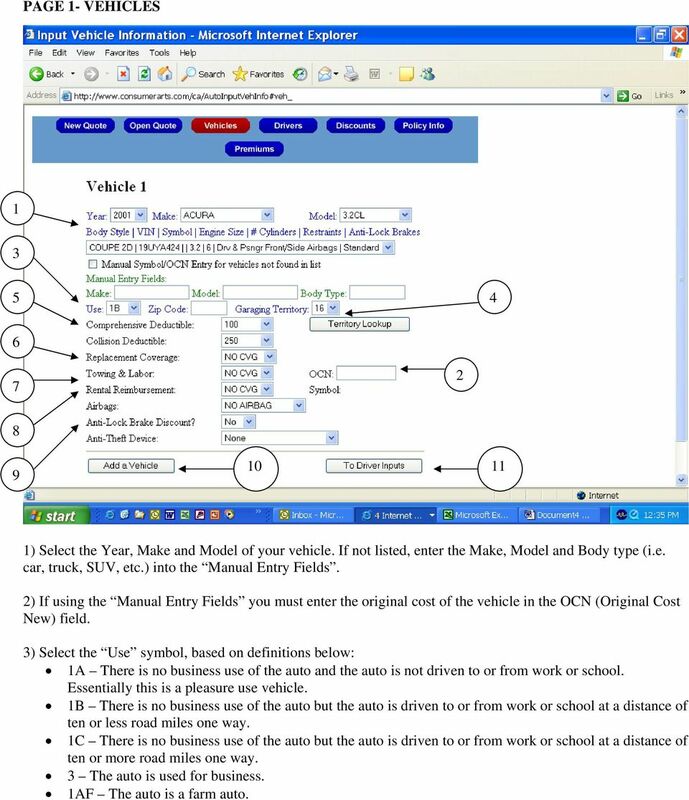 Download "2) If using the Manual Entry Fields you must enter the original cost of the vehicle in the OCN (Original Cost New) field." 1 PAGE - VEHICLES ) Select the Year, Make and Model of your vehicle. If not listed, enter the Make, Model and Body type (i.e. car, truck, SUV, etc.) into the Manual Entry Fields. ) If using the Manual Entry Fields you must enter the original cost of the vehicle in the OCN (Original Cost New) field. ) Select the Use symbol, based on definitions below: A There is no business use of the auto and the auto is not driven to or from work or school. Essentially this is a pleasure use vehicle. B There is no business use of the auto but the auto is driven to or from work or school at a distance of ten or less road miles one way. C There is no business use of the auto but the auto is driven to or from work or school at a distance of ten or more road miles one way. The auto is used for business. AF The auto is a farm auto. 2 ) Garaging Territory select the location where the vehicle is primarily kept. If you happen to know the territory symbol use the drop down menu to pick the territory number, if not use the Territory Lookup button and scroll down the menu until you can find the territory that best describes where you primarily keep your vehicle. ) Select deductible amounts for your Comprehensive and Collision coverages. A deductible is the amount of each covered claim that you are responsible for paying, before the insurance policy begins paying. * Comprehensive Coverage (titled Other than Collision in your auto policy) will pay for damage to your vehicle caused by the following: Missiles or falling objects; Fire; Theft or larceny; Explosion or earthquake; Windstorm; Hail, water or flood; Malicious mischief or vandalism; Riot or civil commotion; Contact with a bird or animal; or Breakage of glass. * Collision Coverage will pay for damage to your vehicle caused by an impact with another vehicle or object. ) If you would like to purchase Replacement coverage on your new vehicle, select the term of the coverage. Vehicles without replacement coverage, when totaled in an accident, are valued at Actual Cash Value (ACV). ACV represents the local market value of your totaled vehicle as if it were to be sold at the time of the accident in its pre-accident condition. 7) Towing and Labor select the amount of coverage you would like to have for each time your covered auto is disabled or the keys are lost, broken or accidentally locked in your car. 8) Rental Reimbursement (termed Extended Transportation Expenses Coverage in your auto policy) select the amount of coverage needed, per day. Rental Reimbursement pays for additional expenses incurred by you, for the use of a non-owned vehicle, due to the loss of use of your covered auto. 9) Airbags, Anti-Lock Brake Discount and Anti-Theft Device select the option that describes your vehicle. If any of these apply to your vehicle you may receive a discount on your premium. 0) Once the information for Vehicle has been input select Add a Vehicle for any additional autos. ) When finished with the vehicle information select To Driver Inputs to continue. 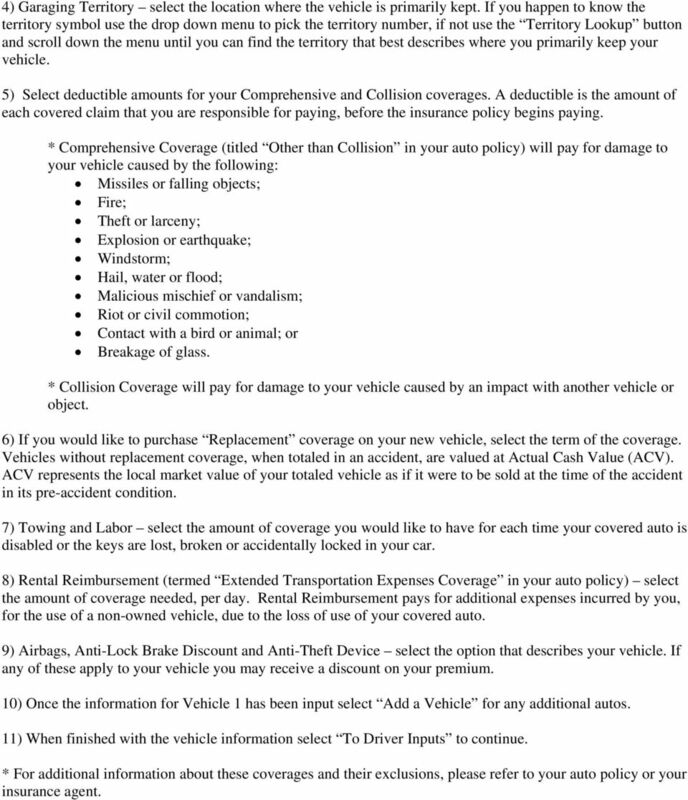 * For additional information about these coverages and their exclusions, please refer to your auto policy or your insurance agent. 3 PAGE - DRIVERS 7 8 ) The name, marital status and relation to insured are only needed if multiple drivers are listed. ) Years licensed and age of driver can help determine the driver s experience and if there are available discounts for senior drivers. ) If there are multiple drivers and vehicles make sure to assign the primary vehicle for each driver. ) An inexperienced operator is a licensed driver who has less than three years of driving experience. ) If you have dependent students listed on your policy, make sure to ask about Good Student and Distant Student discounts when shopping around. ) If the driver selected has any motor vehicle accidents or moving violations, within the past three years, select MVR and follow the instructions. 7) Once the information for Driver has been input select Add a Driver for any additional drivers. 8) When finished with the drivers information select To Discounts to continue. * Please Note: This rating tool will not account for all discounts offered by North Carolina licensed auto insurance companies. The discounts shown are some of the most popular discounts offered by many of the insurance companies. 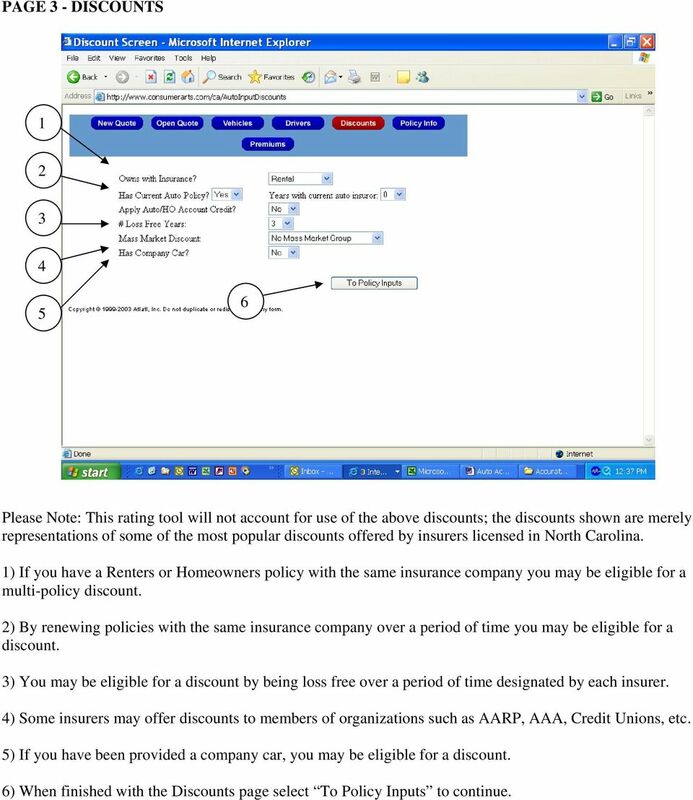 4 PAGE - DISCOUNTS Please Note: This rating tool will not account for use of the above discounts; the discounts shown are merely representations of some of the most popular discounts offered by insurers licensed in North Carolina. ) If you have a Renters or Homeowners policy with the same insurance company you may be eligible for a multi-policy discount. ) By renewing policies with the same insurance company over a period of time you may be eligible for a discount. ) You may be eligible for a discount by being loss free over a period of time designated by each insurer. ) Some insurers may offer discounts to members of organizations such as AARP, AAA, Credit Unions, etc. ) If you have been provided a company car, you may be eligible for a discount. ) When finished with the Discounts page select To Policy Inputs to continue. 5 PAGE POLICY INFORMATION ) Select when the policy will become effective and the duration of the policy. ) Select the limits for Bodily Injury and Property Damage liability coverage, these are expressed in thousands. Bodily Injury coverage will pay for damages to other people as a result of an accident caused by you or another covered driver. Property Damage liability coverage will pay for damages to other people s property as a result of an accident caused by you or another covered driver. ) Select the limit for Medical Payments coverage. Medical Payments coverage pays for reasonable and necessary medical and funeral expenses due to an automobile accident. ) Select the limit for Uninsured Motorist (UM) coverage, this is expressed in thousands. UM coverage will provide protection when an uninsured driver, who is at-fault, injures you or another covered individual. ) 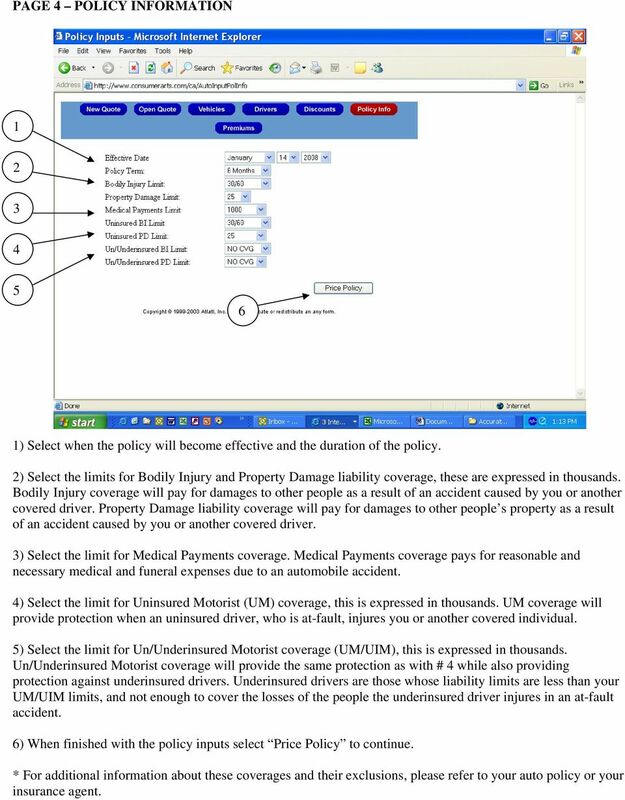 Select the limit for Un/Underinsured Motorist coverage (UM/UIM), this is expressed in thousands. Un/Underinsured Motorist coverage will provide the same protection as with # while also providing protection against underinsured drivers. Underinsured drivers are those whose liability limits are less than your UM/UIM limits, and not enough to cover the losses of the people the underinsured driver injures in an at-fault accident. ) When finished with the policy inputs select Price Policy to continue. * For additional information about these coverages and their exclusions, please refer to your auto policy or your insurance agent. 6 PAGE - PREMIUMS 7 The Premium page displays the selections you have made on the previous pages and displays the resulting premium. 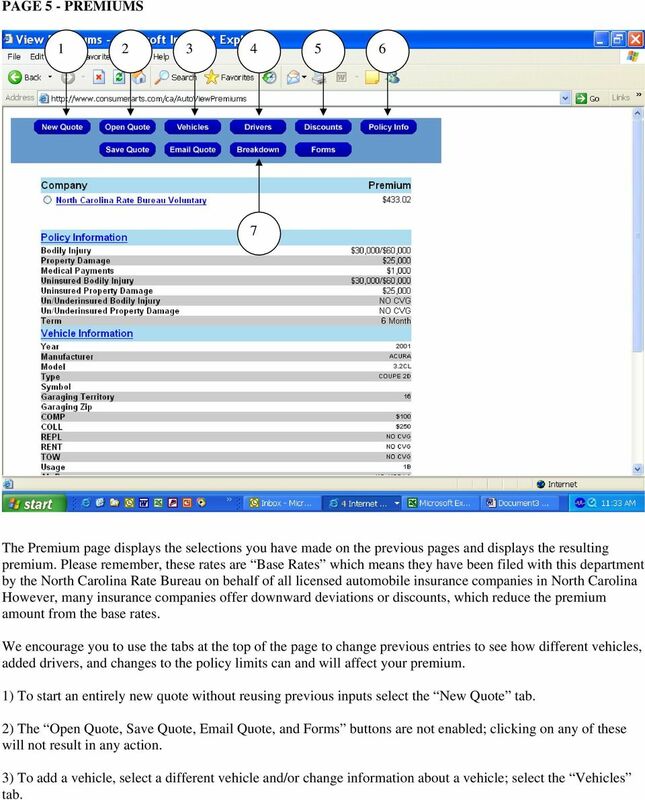 Please remember, these rates are Base Rates which means they have been filed with this department by the North Carolina Rate Bureau on behalf of all licensed automobile insurance companies in North Carolina However, many insurance companies offer downward deviations or discounts, which reduce the premium amount from the base rates. We encourage you to use the tabs at the top of the page to change previous entries to see how different vehicles, added drivers, and changes to the policy limits can and will affect your premium. ) To start an entirely new quote without reusing previous inputs select the New Quote tab. ) The Open Quote, Save Quote, Quote, and Forms buttons are not enabled; clicking on any of these will not result in any action. ) To add a vehicle, select a different vehicle and/or change information about a vehicle; select the Vehicles tab. 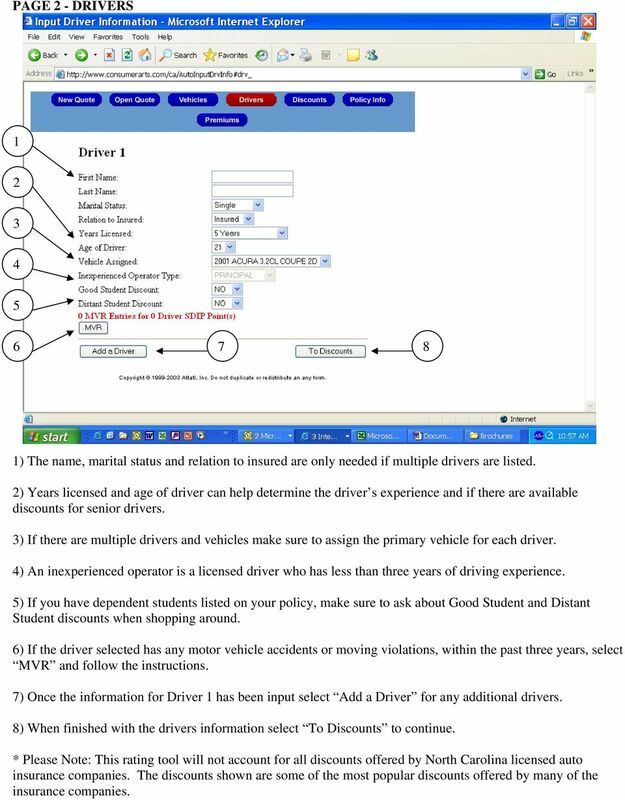 7 ) To add a driver or change information about a driver; select the Drivers tab. ) Select the Discounts tab to view the discounts listed. Please remember the discounts shown are merely representations of some of the most popular discounts offered by insurers licensed in North Carolina and thus choosing to select or not will not affect the rates shown. ) To change the policy term and coverage limits, select the Policy Info tab. 7) The Breakdown tab will show how the premium is allocated to the different coverages. You must select North Carolina Rate Bureau Voluntary in order to see the results. Drive confidently. Protecting that investment with a Stillwater Auto policy helps you do those things confidently. The Texas A&M University System Auto Liability Plan Page 1 Tuesday, September 28, 2010 Table of Contents I. Automobile Liability...3 II. III. IV. Rental Vehicles.4 Personal Autos..4 Plan Exclusions.4 V.
APPENDIX #1. Example 1-B Driver:Use same criteria as 1-A, except one at-fault accident.